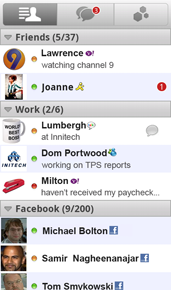 BeejiveIM is a multi-protocol instant messaging client that supports AIM/iChat/MobileMe, MSN/Windows Live, Yahoo!, Facebook, MySpace, GoogleTalk, ICQ and Jabber. BeejiveIM is now available for Anroid phones. To purchase ($9.99) visit the Android Market on your Android smartphone. Beejive offer a 30 day trial of BeejiveIM for Android. Go to www.beejive.com/android on your Android smartphone and following the instructions found there to download and install the trial. BeejiveIM for Android requires Android OS 2.0 or higher.